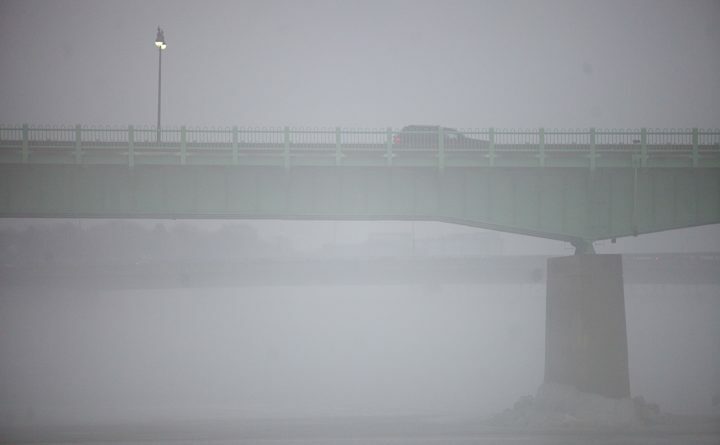 A car passes over the Joshua Chamberlain Bridge in this January 2014 file photo. Bangor police and firefighters recovered a body Saturday afternoon from the river near the bridge and have sent it to the State Medical Examiner's office in Augusta to be identified. BDN file photo. Bangor police and firefighters on Saturday recovered a body from the Penobscot River, near the mouth of the Kenduskeag Stream. A boater found the body at 2:30 p.m, police Sgt. Wade Betters said. It floated to the surface of the water near the Joshua Chamberlain Bridge and the docks beside Sea Dog restaurant. In 2016, the body of a Maine Maritime Academy student who fell into the Stillwater River in Orono — which flows into the Penobscot — was found near that location. A strong current flowing from the Kenduskeag and underwater debris on the riverbed have trapped objects underwater and prevented them from coming to the surface in the past, searchers have said. That location where the body was found is about a quarter mile from where Peter Manuel, a 22-year-old Bangor man, fell into frozen Kenduskeag Stream on March 2 and got trapped beneath the ice. He is presumed dead, and searchers have been looking for him on a weekly basis ever since. Betters declined to comment on the possible identity of the body, which has been sent to the Maine medical examiner’s office in Augusta for an autopsy. Police expect to release the person’s identity pending the autopsy, he said.